In India we use rupees and paise as money. In our daily life we purchase the required things from a shop and pay money to the shopkeeper for the purchased thing. Money is available in two forms (i) Coins and (ii) Currency notes. Coins: The shapes and size of coins are changed from time to time. Nowadays the coins of one paise to twenty paise are not in use. 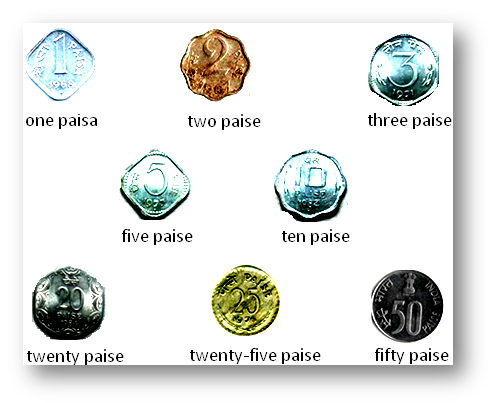 The coins of 50-paise, 1-rupee, 2-rupee and 5-rupee denominations are mostly in use. 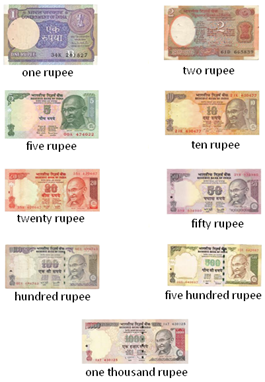 Currency notes: The shapes, sizes and designs of these currency notes are changed from time to time. In case of 1-rupee, 2-rupee and 5-rupee denominations, both coins as well as notes are used. One rupee, two rupee notes are rarely available now. Five rupee, ten rupee, twenty rupee, fifty rupee notes are available now. Nowadays mostly coins of one rupee, two rupee and five rupee are in use.